Shadwell 1982 by Dave Binnington , Desmond Rochfort , Paul Butler & Ray Walker. Keim Silicate Paint. '¡No Pasarán!' - London's most famous mural? The events depicted in this mural epitomise the fight against fascism and far-right activism in London; sadly, the creation of the mural itself demonstrates that this struggle is an ongoing one. It can be found in a part of London probably most synonymous with immigration, firstly of Huguenots in the 17th Century, followed by the Irish, Ashkenazi Jews and most recently Bangladeshis. Back in 1936, as now, immigrants were easy scapegoats for the country’s problems, and with the rise of anti-Semitism in much of Europe at the time, Cable Street’s Jewish population were an obvious target for a demonstration by Oswald Mosley’s British Union of Fascists on 4th October 1936. An estimated 300,000 Jews, Irish Dockers, Communists, Labour Party Members, Trade Unionists and residents of the East End came together to oppose the Blackshirts of the BUF, united by a common call, echoing that of anti-fascist forces in the Spanish Civil War: ¡No Pasarán! – They Shall Not Pass! In reality the Battle was with the Police who tried to remove the barricades erected by the anti-Fascists to allow the march to go ahead, but Mosley’s troops had already scuttled off to Hyde Park, tails between their legs. The mural depicts the events of a very physical confrontation between police and protesters in stunning detail: anti-fascist protesters proudly carrying banners; punches being thrown; a barricade of furniture and an overturned vehicle across Cable Street manned by residents of all ages and ethnic backgrounds; a chamber pot being emptied from a first floor window onto BUF members below; marbles being thrown under the hooves of horses being ridden by baton-wielding police; a fascist, with a startling resemblance to Adolf Hitler, looking very alarmed in just his underwear and socks; a police autogyro overhead observing events. Work on a commemorative mural began back in 1976 when Dan Jones, Secretary of the Hackney Trades Council saw a mural under the Westway in west London and asked the artist, Dave Binnington, if he would like to undertake a project at Cable Street. An Arts Council grant allowed Dave to set up in the basement of St George's Town Hall, from where he undertook extensive research into the events of October 1936, examining photographs and news reports, viewing newsreel footage and, perhaps most importantly, consulting and interviewing local residents, some of whom were later depicted in the mural. This initial stage of the project culminated in a public meeting on 18th October 1978 at which the final design, depicting the events of the Battle using a fish-eye perspective, was presented to local people, most of whom were supportive. However, one letter to a local paper described it as 'a political graffiti' while another writer asked: 'Do we need a reminder in the form of a large picture of violence being perpetually re-enacted?' Dave Binnington's response to such comments was that '...I'm a realist, and life isn't normal and happy, even today, with people being knifed and bottled just like in those far off pre-War days. I want this mural to be colourful and attractive, and to tell a story too without just being part of the Thirties nostalgia boom. I hope it will also be a monument to our ability to overcome oppression'. With further funding in place from the Greater London Arts Association, the E Vincent Harris Fund for Mural Decoration, the Gulbenkian Foundation, the Leonard Cohen Trust, Greater London Council and the Royal Academy, work to finally paint the mural, on 3,500 square feet of the recently re-rendered wall of St George's Town Hall, using 150 gallons of paint, and at a cost of £18,000, began in late 1979. Dave was hoping that the mural could be completed by 4th October 1980, the 44th anniversary of the Battle. But work was much delayed by technical problems, and by the sheer scale of the task ahead, and came to a halt at the end of 1981. Then on May 23rd 1982, far-right activists vandalised the incomplete mural, daubing it with slogans such as 'British Nationalism not Communism', 'Rights for Whites' and, somewhat ironically, 'Stop the Race War'. Exhausted and frustrated, Dave Binnington resigned from the project. An attempt was made by volunteers, including local Councillors Graham Allen, Asheek Ali and Joe Ramanoop, to clean up the damage using white spirit but this was unsuccessful. Then in July 1982, Paul Butler, who had been discussing the project with Dave Binnington, got in touch with Ray Walker and Desmond Rochfort, and the three of them decided to take up the challenge of completing the Cable Street mural. The top section was completed largely along the lines of Dave Binnington's original design, then the vandalised lower section was sand-blasted, re-rendered and primed. Each artist then carried out research and produced drawings, Walker for the left hand section, Butler for the middle, and Rochfort for the right hand third; the result utilised a different perspective to that of Binnington's original fish-eye design, much apparent from the finished mural. Work continued on the mural until it was finally completed in March 1983 and on 7th May that year it was officially opened by Cllr Paul Beasley, Leader of Tower Hamlets Council, accompanied by Jack Jones(former General Secretary of the Transport and General Workers Union), Tony Banks (Chair of the Greater London Council Arts Committee) and Dan Jones. 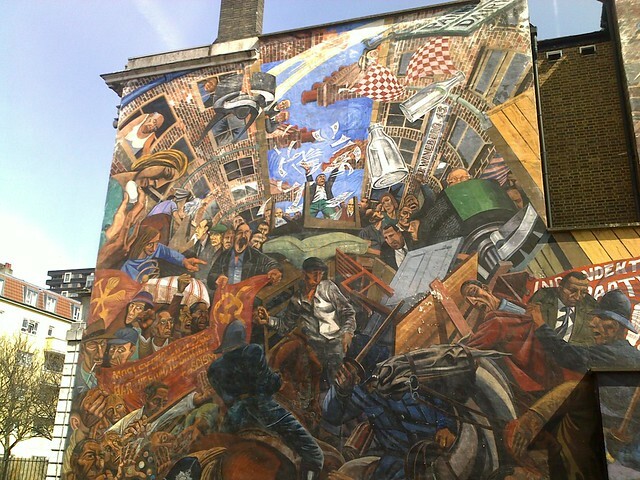 It would be nice if the story of the Cable Street mural ended there. But sadly it was vandalised again a number of times, most notably in June 1993 when it was attacked with paint bombs. The damage caused then was repaired at a cost of £19,000 (of which £18,000 came from Tower Hamlets Council and £1,000 from the Cable Street Group) by Paul Butler at a time when tensions were high due to forthcoming elections in which the British National Party were standing. As well as a swaying scaffold tower caused by strong winds, Paul had to contend with intimidation from far-right activists who poured paint on his car and slashed its tyres. The mural has avoided the attentions of its adversaries since then and it is hoped that the presence of a CCTV camera and a pledge by Cllr Denise Jones in 1994 that '...the Council are committed to restoring the mural whenever it is damaged' will ensure its long-term future. UPDATE 2011 During the summer of 2011, after much preparatory work, the Cable Street mural was restored by Paul Butler , one of the original artists. Initially a conservation team injected a seal to glue the render firmly onto the building wall. Then the piece was generally re-worked from top to bottom with focus on re-painting some areas more than others. Some more information about the restoration can be found here. The mural is in excellent condition, thanks to recent restoration work. If arriving by Dockland Light Railway, turn left at the bottom of the escalators to exit the station onto Watney Street, passing Shadwell Overground Station on the left, to the junction with Cable Street. If arriving by London Overground, exit directly onto Cable Street. Turn right and head 150 yards west to St George's Town Hall. Turn left just past the Town Hall to enter St. George's Churchyard (now a park) - the mural will be on your left, on the west elevation of the Town Hall.